Latin America’s powerhouse LATAM Airlines Group marked the third anniversary of the merger between LAN and TAM with worsening conditions in one of its largest markets, Brazil. The country’s currency devaluation and soaring inflation is dragging down the results of airlines operating into and within Brazil, and LATAM is no different. 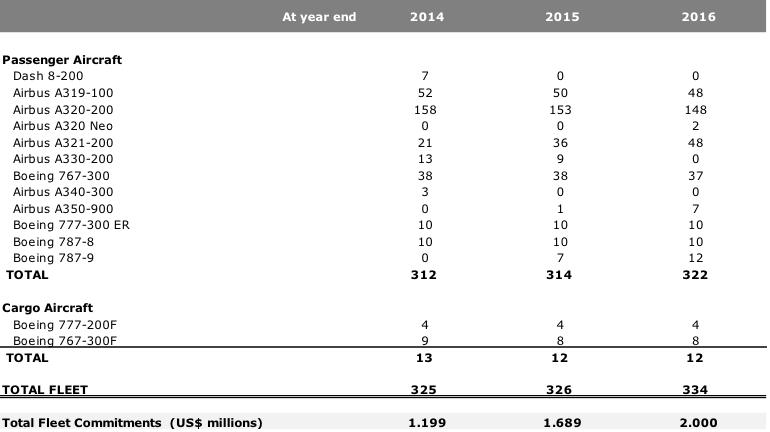 Its top line revenues fell nearly 22% in 2Q2015 as it faced deteriorating conditions in Brazil. Similar to other Latin American airlines, LATAM has opted to cut its 2015 capacity forecast for Brazil while refining its operating margins downwards as it adjusts to the lingering challenges in the country. LATAM is seeing some positive demand trends outside of Brazil, but at the same time is navigating continuing currency pressure in other geographies. Since the close of the merger, LATAM has faced a downward spiral in Brazil as the country’s economy started sinking. The pressure will likely continue for the short to medium term, as most forecasts for 2016 indicate a further contraction in the country’s economy. LATAM’s top line revenues fell 20.8% year-on-year in 2Q2015 to USD2.4 billion. Passenger revenues declined 21.8% to USD2 billion and unit revenues dropped 23% driven by a 22.8% decline in yields. The company’s unit revenues from its Brazilian operations fell 12% in 2Q2015 measured in the BRL, although measured in the USD the drop was more dramatic at 34.4%. The unit revenue decline denominated in the USD was driven by the BRL’s devaluation against the USD, reaching 34% during the quarter. TAM’s domestic capacity within the Brazilian market fell 0.5% in 2Q2015 but traffic dropped 1.9% resulting in a 1.2ppt drop in load factor to 79.5%. During 2Q2015 Brazil represented 32% of LATAM’s capacity. 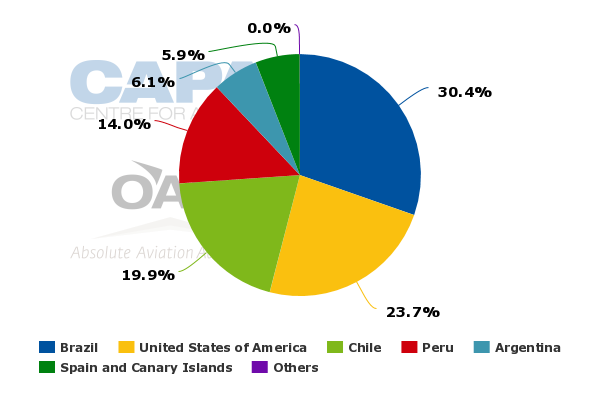 Data from CAPA and OAG for the week of 17-Aug-2015 to 23-Aug-2015 show that Brazil represents roughly 30% of LATAM’s international ASMs. Brazil’s inflation rate grew to more than 9% during 2Q2015, and it appears that some slight strengthening in corporate demand, cited by TAM in 1Q2015, has eroded at LATAM, who reported a decline in corporate demand as one of the factors for the revenue slide in Brazil. The worsening conditions in Brazil have led LATAM to revise its 2015 capacity forecast for the region. For the full year the company plans a capacity decrease of 2% to 4% versus previous forecasts of flat growth. The bulk of the pull-down appears to be occurring in 4Q2015 as LATAM projects its domestic supply in Brazil to drop 8% to 10% year-on-year. TAM’s main domestic rival Gol has also recently revised its forecast downwards to a one percent decline in 2015. During 2H2015 Gol projects a 2% to 4% drop in domestic capacity versus growth of 2% in 1H2015. Copa Airlines has also opted to reduce its capacity to Brazil as the country’s economic conditions have worsened. LATAM stressed that it is “still covering the same percentage of the domestic flows and...we’re leveraging our most important hub, which is Brasilia,” company executives recently stated. During 2015 LATAM is making a push from Brasilia, adding 11 domestic routes from the airport. The company also highlighted the capacity pull down in Brazil for 2015 does not affect its long-term strategy, which includes a feasibility study to establish a hub in the northeastern region of the country. Previously, TAM has stated that the candidates for the hub are Fortaleza, Natal and Recife. At one point, LATAM had outlined plans to unveil the winning candidate by YE2015 and launch the new hub in Dec-2016; but the timing may have changed given Brazil’s weakening economic climate. News outlet Bloomberg recently cited analysts estimating that Brazil’s economy could shrink by 0.15% in 2016 after contracting 2% in 2015, noting the last time Brazil’s economy contracted for two consecutive years was 1930-1931. Traffic in LATAM’s Spanish speaking markets – Chile, Peru, Argentina, Colombia and Ecuador – grew 5.4% in 2Q2015, which was a faster increase than the 4.3% capacity growth. As a result, load factors grew 0.8ppt to 77.9%. Unit revenues in those markets had the smallest decease year-on-year, falling 7%. LATAM stated that overall yields in those markets showed improvements when measured in local currencies. But in addition to currency pressure in Brazil, LATAM has also been battling currency pressure in some of its Spanish speaking markets for about a year. During 2Q2015, LATAM estimated that Chilean, Peruvian and Colombian currencies depreciated 10%, 11.3% and 28.4% respectively, against the USD. LATAM also cited double digit industry capacity growth of 15% to 17% in Colombia, which is creating some pressure on yields. 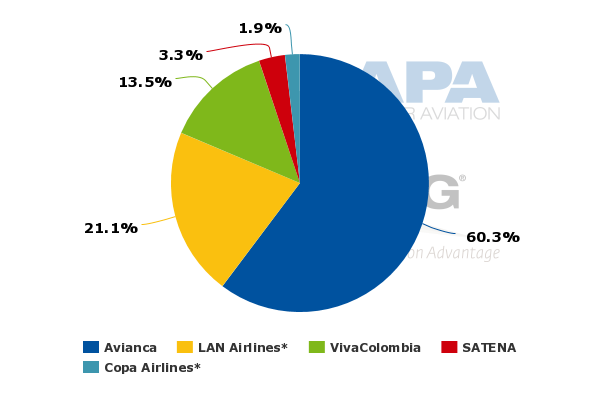 Data from CAPA and OAG show that for the week of 17-Aug-2015 to 23-Aug-2015 LAN represents 10% of Colombia’s system wide ASMs and 21% of domestic ASMs. LATAM executives explained that the company is examining the effects of COP devaluation for its 2H2015 capacity growth in Colombia, highlighting that the company posted a large amount of capacity growth in the Colombian market during 2H2014. 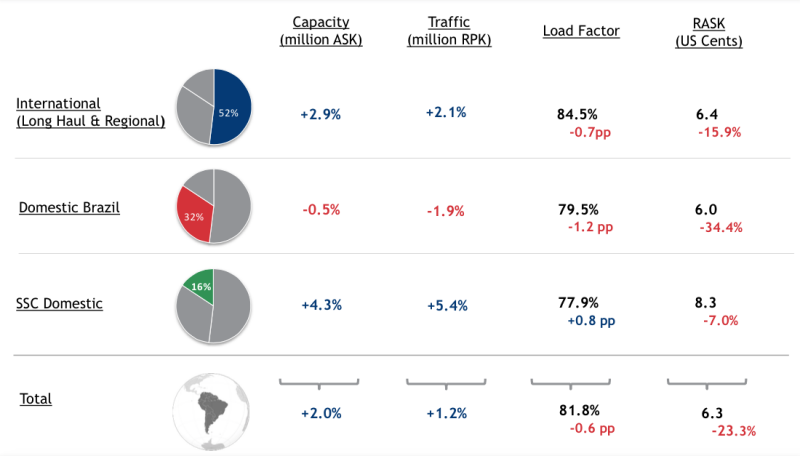 LATAM increased capacity on its long-haul international routes by 2.9% in 2Q2015, and traffic on those routes grew 2.1%. Pressure on yields, largely driven by Brazilian weakness, helped drive unit revenues down 15.9%. LATAM is attempting to mitigate that pressure by adjusting its point of sale mix within the region to focus on markets with stronger demand. The company’s new international routes launched in 1H2015 include Lima and Brasilia to Orlando, Brasilia to Buenos Aires and the addition of Toronto onto its Sao Paulo-Guarulhos-New York JFK routing. LAN is uncontested on the service between Lima and Orlando, and will face competition from Delta Air Lines on its service from Brasilia to Orlando in late 2015. Air Canada operates direct service from Guarulhos to its hub in Toronto. Aerolineas Argentinas, Gol and TAM all operate between Brasilia and Buenos Aires. 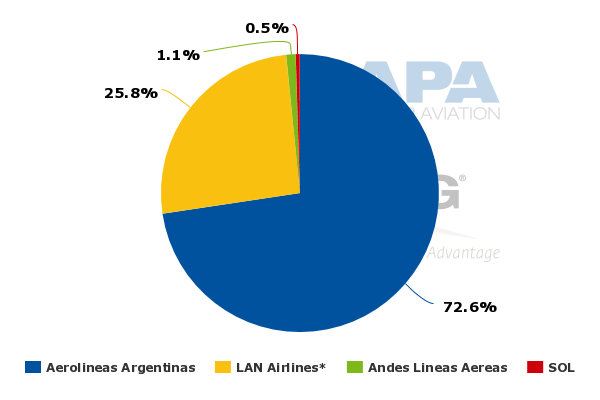 LAN will gain some leverage on that route due to its stature as Argentina’s second largest domestic airline measured by ASMs. 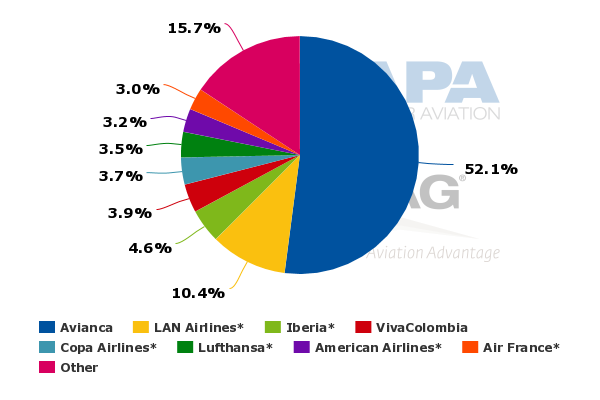 Both LAN and TAM can leverage onward connections in Brazil and Argentina to boost passenger levels on the route, perhaps an example of the network benefits generated by the merger. LATAM is continuing to leverage Lima in 2H2015 and 1Q2016 with new service to Montevideo (Jan-2016) in Uruguay and Antofagasta, Chile (Dec-2015). It will compete with Avianca (the brand of the merged Avianca and TACA) on service to Montevideo and will be uncontested on service to Antofagasta. Schedules in CAPA and OAG show that Chilean carrier Sky Airlines has previously operated on the Lima-Antofagasta route, but is not currently serving the market (17-Aug-2015 to 23-Aug-2015). Although Peru is undergoing some currency devaluation, its economic growth is projected at 3.8% in 2015 and nearly 5% in 2016. LATAM for the last couple of years has been indicating it wanted to increase the leverage of Lima as a north-south transiting point, and redeploying capacity into Lima seems like a logical move given the conditions in Brazil. Peru is also posting solid passenger growth numbers. For 1H2015 its passenger numbers increased 9.9% to 8.5 million, with the domestic market growing 12.7% to 4.6 million passengers. International passengers grew by 6.8% to four million. LAN is the country’s largest airline measured by both system wide and domestic ASMs. LATAM’s new long-haul routes for the remainder of 2015 include service from Santiago to Milan via Sao Paulo and Guarulhos to Barcelona. TAM already operates flights from Sao Paulo to Milan, but no service is available to Milan from Santiago. Singapore Airlines operates through Barcelona on its flights from Changi airport to Guarulhos. LATAM has opted to push back four aircraft deliveries – four narrowbodies and one widebody – from 2016 to 2017, and has also stated it is evaluating whether to postpone some widebody jets scheduled for delivery in 2017 and 2018 in addition to subleasing a freighter aircraft. 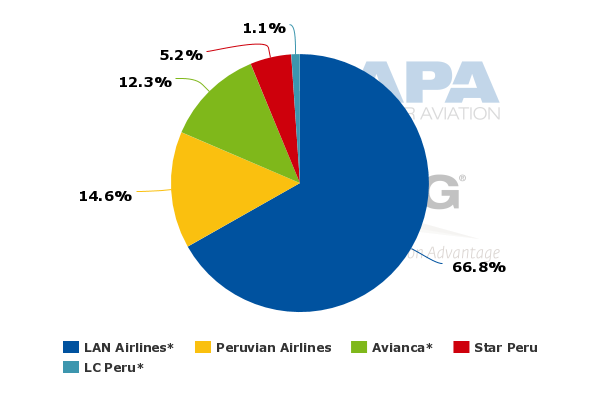 From 2014 to 2015 LATAM’s fleet is remaining essentially flat, increasing by just one aircraft. Between 2015 and 2016, its fleet is scheduled to grow from 326 aircraft to 334. Company executives highlighted single aisle fleet flexibility, estimating that 5% to 7% of its narrowbodies have leases that expire each year or are phased out due to age, so there is flexibility with respect to returning aircraft off lease or extending lease periods. LATAM also believes it has added flexibility of moving aircraft between the LAN and TAM fleets to combat areas of weakness. The weak demand in Brazil has forced LATAM to revise its 2015 operating margins downward to 3.5% to 5% from 6% to 8%. Copa also recently issued a downward revision in margins due in part to Brazil’s economic weakness. LATAM is faced with the balance of weathering tough conditions in one of its most strategic markets – Brazil – against being prepared to leverage its strength in the country over the long term, and fully leverage the powerful network of the combined LAN and TAM. Its leverage is trending in the right direction, with adjusted net debt to EBITAR falling from 5.5x in 3Q2014 to 5.1X in 2Q2015. Cash balances as a percent of 12M trailing revenues have increased from 9.7% to 14.1%. 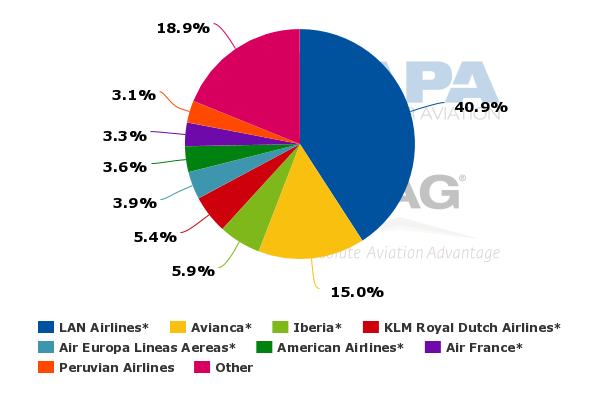 Similar to most Latin American airlines with significant exposure to Brazil, the macroeconomic conditions will continue to pressure LATAM and other carriers for the short to medium term. LATAM is working to mitigate the damage while preserving its strategic place in Brazil’s market, which will remain a challenge for the foreseeable future. Ultimately, LATAM is positioned to capitalise on large levels of demand in Latin America that remain untapped, but for now it needs to endure short term pain before fully leveraging its powerful position in the Latin American market.